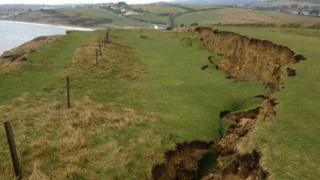 Walkers have been warned about a large crack which has appeared near a stretch of the Dorset coast path. The 150ft (45m) long, 6ft (1.8m) deep crack appeared on cliffs near Bowleaze Cove, Weymouth, on a clay section of coastline. Councillor Ian Bruce said: "It's clearly very large and part of the cliff looks like it is about to go." A Coastguard spokeswoman said they were aware of the crack and urged the public to heed any warning signs. Richard Edmonds, Jurassic Coast earth science manager at Dorset County Council, said: "We have had a lot of rain and that drives landslides but in our experience these things are slow and progressive events that usually provide plenty of warning as they start to fall. "However, landslides can create rock falls and treacherous mudflows and our advice, as always, is to stay away from the cliffs and take note of local safety signs in the area," he added. Heavier than usual rainfall since last spring has led to a number of landslip incidents. A section of cliff came down on Swanage beach just before Christmas, and Charlotte Blackman, 22, died on Hive Beach at Burton Bradstock in July when 400 tonnes of rock fell on to the beach.